His Highness Sheikh Mohamed bin Zayed Al Nahyan, Crown Prince of Abu Dhabi and Deputy Supreme Commander of the UAE Armed Forces, met with the trailblazers at the Qasr Al Bahr Majlis in the capital. 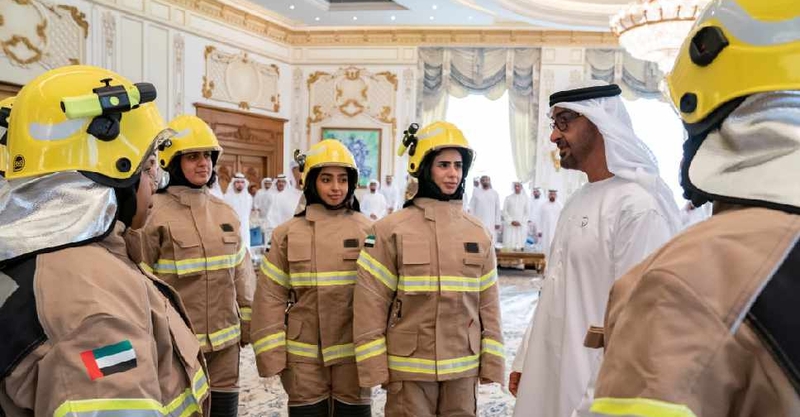 The women recently graduated from a firefighting course in Sharjah. "The UAE woman is always proving her worth in performing all the national tasks assigned to her, excelling herself in fulfilling her responsibilities and meeting her obligations," said Sheikh Mohamed. "The UAE, under the leadership of President His Highness Sheikh Khalifa bin Zayed Al Nahyan, set women's empowerment on top of the country's national priorities, with women now being true partners and contributors to the national developmental drive and strategic plans for the nation's present and future."